A mysterious sorcerer, Evilseed, uses his magic to cause plants to take control of Eternia. To stop him, He-Man and Skeletor must join forces. 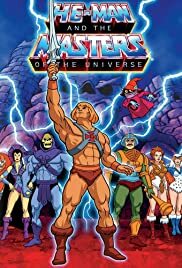 How many episodes of He-Man and the Masters of the Universe have you seen? Prince Adam is sent to the world of Etheria to find his long abducted sister, Adora, and awaken her to her own destiny. Adam: I am Adam. Prince of Eternia and defender of the secrets of Castle Greyskull. This is Cringer... my fearless friend. Fabulous secret powers were revealed to me the day I held aloft my magic sword and said... By the power of Greyskull! One thing many people do not realize especially the person who posted a comment before i did is that the advice scenes at the end of each episode of this show and 8 or 9 other shows taught good things to children and compared to today's shows this is one show that all children need to watch because when this show and the other shows of that group of 8 or 9 shows were all on you rarely got news reports of kids being caught with Guns, Knives, Drugs, or Exsplosives on school grounds because this show and the others taught kids right from wrong. This show focused on teaching kids to obey their parents and other elders where the new TV shows promote violence and destruction. I feel that this show should be seen by all of the young children that are under 10 years old.